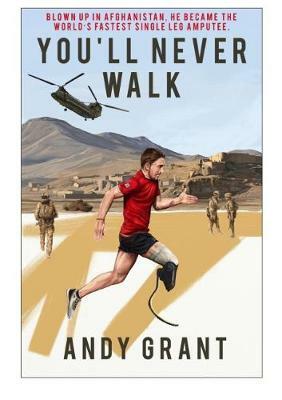 We are very delighted to welcome former Royal Marine, award winning athlete and motivational speaker Andy Grant to Waterstones Northallerton as he joins us to sign copies of his outstanding new book You'll Never Walk. When Andy Grant's eyes blinked open from a 10-day coma in February 2009, he was alone in a hospital bed in Birmingham. He had a broken sternum, a broken leg, a broken elbow and shrapnel lodged in both forearms. He had a severed femoral artery, nerve damage to his hands and feet as well as deep gaping wounds in both of his cheeks. He had been blown up during a routine foot patrol in Afghanistan. Within days of coming to his senses, a doctor told Andy that because of the blast he would no longer be able to have children. You'll Never Walk is his story.